ll American Model #25X 25 Quart Electric Sterilizer Wisconsin Aluminum Foundry was first in the field to develop an immersion-type pressure sterilizer for physicians’ offices, hospitals and laboratories. The electric ALL-AMERICAN® Sterilizer is a complete, self-contained unit with an immersion heating element, automatic thermostatic control, automatic release valve, and pilot light. 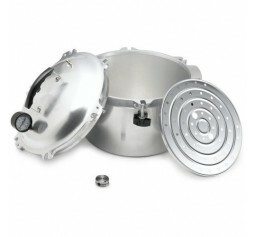 It connects to any outlet, is ready for use instantly, and ensures complete, efficient sterilization. Model 25X (25 qt/24 liter) ..
All American Model #50X 25 Quart Electric Sterilizer Wisconsin Aluminum Foundry was first in the field to develop an immersion-type pressure sterilizer for physicians’ offices, hospitals and laboratories. The electric ALL-AMERICAN® Sterilizer is a complete, self-contained unit with an immersion heating element, automatic thermostatic control, automatic release valve, and pilot light. 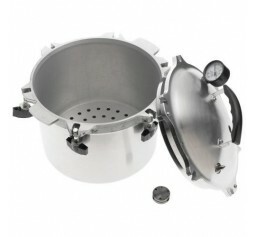 It connects to any outlet, is ready for use instantly, and ensures complete, efficient sterilization. 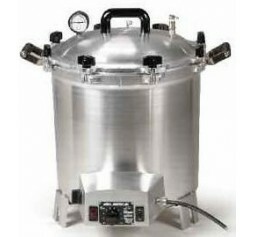 Model 50X (25 qt/24 liter) ..
All American Model #75X 41 Quart Electric Sterilizer Wisconsin Aluminum Foundry was first in the field to develop an immersion-type pressure sterilizer for physicians’ offices, hospitals and laboratories. The electric ALL-AMERICAN® Sterilizer is a complete, self-contained unit with an immersion heating element, automatic thermostatic control, automatic release valve, and pilot light. It connects to any outlet, is ready for use instantly, and ensures complete, efficient sterilization. Model 75X (25 qt/24 liter) .. Size Capacity - 10 Quarts (9.5 ltr) (Liquid) 7 Pint Jars, (7 x 500ml) 4 Quart Jars ( 4 x 1ltr) Inside diameter - 26 cm Inside Height - 20 cm Overall Length - 33 cm Overall Height - 31 cm Crafted of the finest hand cast aluminum Stay-cool bakelite top handle Geared steam gauge Pressure regulator weight with settings of 5, 10 and 15 psi Smooth, easy to clean satin finish Exclusive metal-to-metal seal - no gaskets to crack, burn, replace or clean Double thickness edges for additional protection on points of heaviest wear Automatic o.. Size Capacity - 15.5 Quarts = 15 litres (Liquid) 10 Pint Jars (10 x 500ml) 7 Quart Jars (7 x 1 litre) Inside diameter - 31.5 cm Inside Height -19 cm Overall Length - 40 cm Overall Height - 32 cm Crafted of the finest hand cast aluminum Geared steam gauge Pressure regulator weight with settings of 5, 10 and 15 psi Smooth, easy to clean satin finish Exclusive metal-to-metal seal - no gaskets to crack, burn, replace or clean Double thickness edges for additional protection on points of heaviest wear Automatic overpressure release Includes ca.. 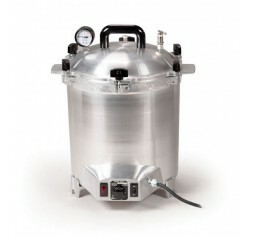 Size Capacity - 21.5 Quarts = 20 liters (Liquid) 19 Pint Jars (19 x 500ml) 7 Quart Jars (7 x 1 litre) Inside diameter - 31.5 cm Overall Length - 40 cm Overall Height - 39 cm Crafted of the finest hand cast aluminum Geared steam gauge Pressure regulator weight with settings of 5, 10 and 15 psi Smooth, easy to clean satin finish Exclusive metal-to-metal seal - no gaskets to crack, burn, replace or clean Double thickness edges for additional protection on points of heaviest wear Automatic overpressure release Includes cannin.. 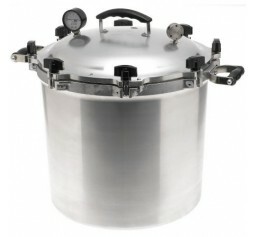 Size Capacity - 25 Quarts = 23.5 litres (Liquid) 19 Pint Jars (19 x 500ml) 7 Quart Jars (7 x 1 litre) Inside diameter - 31.5 cm Overall Length - 40 cm Overall Height - 43 cm Crafted of the finest hand cast aluminium Stay-cool bakelite top handle Geared steam gauge Pressure regulator weight with settings of 5, 10 and 15 psi Smooth, easy to clean satin finish Exclusive metal-to-metal seal - no gaskets to crack, burn, replace or clean Double thickness edges for additional protection on points of heaviest wear Automatic overp.. 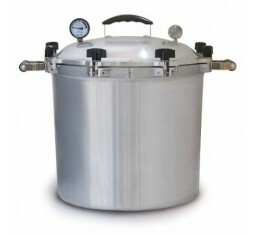 Size Capacity - 30 Quarts / 28.5 Litres (Liquid), 14 Quart Jars (1 Litre), 19 Pint Jars (500ml) Inside diameter - 32 cm Inside Height - 36 cm Overall Height - 48.3 cm Crafted of the finest hand cast aluminum Stay-cool bakelite top handle Geared steam gauge Pressure regulator weight with settings of 5, 10 and 15 psi Smooth, easy to clean satin finish Exclusive metal-to-metal seal - no gaskets to crack, burn, replace or clean Double thickness edges for additional protection on points of heaviest wear Automatic overpressure release .. 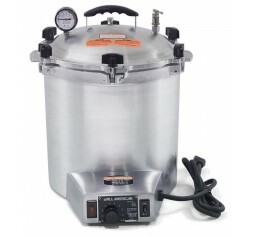 THE BIGGEST PRESSURE COOKER ON THE MARKET! It is large and heavy-cast for processing larger quantities Size Capacity - 41.5 Quarts - 39 Litres (Liquid) 32 Pint Jars, (32 x 500ml) 19 Quart Jars ( 19 x 1ltr) Inside diameter - 39 cm Inside Height - 37 cm Overall Height - 49 cm Features: Crafted of the finest hand cast aluminum Stay-cool bakelite top handle Geared steam gauge Pressure regulator weight with settings of 5, 10 and 15 psi Smooth, easy to clean satin finish Exclusive metal-to-metal seal - no gaskets to crack, burn, replace or clean Double th..